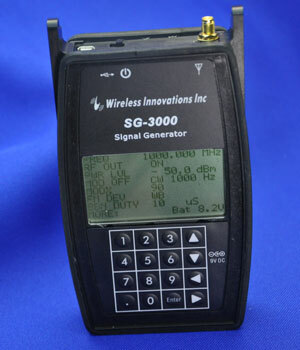 The SG-3000 is a full function signal generator suitable for field test and calibration applications. It spans 30-3000 MHz in 1 KHz increments, with selectable AM, FM, or noise modulation. Amplitude is calibrated in 1 db steps, from -117 dbm to +10 dbm. The unit is packaged in the same rugged metal case as the aardvark, with flip open cover, LCD, keypad, and optional log periodic antenna for use as a beacon or test source. It operates from a 9v battery, external DC power, or optional battery trays.